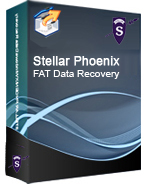 Stellar Phoenix - FAT Recovery Software helps in easy recovery of your all-important data lost after an accidental format virus attack software malfunction filedirectory deletion or even sabotage! This data recovery utility examines your inaccessible hard drive and shows you the data that is present in the hard disk. Simple FAT disk recovery process requires you to only select listed files & directories and copy to a working drive. Phoenix is a quick simple and easy to use FAT recovery solution that helps you in file recovery in moments of disaster of a disk crash.This Award winning file recovery utility is a must for SMEs having mission critical data. Key Features: Provides file recovery from deleted and damaged partitions. Provides recovery from missing files(s) and folder(s). Data recovery after the loss of MBR Boot sector or total loss of allocation information (FAT). Provides recovery of data lost due to accidental formatting of your hard disk. Recovery of file that becomes in accessible due to a virus attack. Provides file recovery from fragmentedbroken directories through its advanced search features. This data recovery utility recognizes and preserves localized names. Advanced file search and file filtering options for refined FAT data recovery results User-friendly Interface: This FAT Recovery Utility creates a directory and file tree of the file(s) and folder(s) found on the logically damaged hard disk and allows user to select the data and transfer it to destination path. Standard Wndows Explorer - style interface.